As a working scientist, I really want to get deep into the science of brewing, especially the microbiology of brewing. Throughout the life of this blog, who knows how long that will be, I want to sprinkle in articles with high resolution details about the organisms that we, as brewers, work with on a daily basis or common properties of organisms we deal with. For example, I’m writing an article about pellicles right now, that will be up soonish. This is the first of a series of articles. I’m hoping by the end of 2015, there will be a nice set of these for people to use as resources. This post is going to be more technical than some of my posts but I’m hoping that there is valuable information in here for either the science enthusiast or the guy that likes to tell people the chemical name of that green apple taste and approximately how it was made. I want this to be as specific as possible but I will try to make it obtainable to the basic reader. This is mostly a dumping ground for a few years worth of notes on yeast metabolism. There will be posts on Lactobacillus, Pediococcus, Acetobacter, and Brettanomyces at later dates, basically any organism that does fermentation, I’ll write a post about it eventually. This post is focused on Saccharomyces because you have to start somewhere and most people start here with their brewing. The fermentation of wort into beer is a chemical transformation catalyzed by a group of microorganisms, both yeast and bacteria, that primarily produce carbon dioxide (CO2) and ethanol (CH3CH2OH). This is what I refer to as the “30,000 foot view” of fermentation. The Grand Canyon is beautiful looking out of the portal in the side of the airplane as you fly over, but to understand the Grand Canyon, you have to get your boots on the ground. Side note, everyone go to the Grand Canyon. It is common knowledge to even the most basic brewer or appreciator of good beer that there are other compounds that can be created as well, such as lactic acid (CH3CHOHCOOH) and other organic acids. But even with this added subtly, there are still dozens of additional compounds that lead to yeasts having unique flavors. Think about the difference between a hefeweizen yeast and an American ale yeast. The American ale yeast is far more “neutral” than the hefeweizen yeast, which might give you a banana or clove flavor. Both are Saccharomyces cerevisiae, but why do they taste so different? The answer is, the hefeweizen yeast produce more secondary metabolites that give it those flavors. The enzymes responsible for the formation of compounds for banana flavor / aroma (isoamyl acetate and isobutyl acetate) and clove flavor / aroma (4-vinyl guaiacol) are expressed in that strain and not expressed in the American ale yeast. Why? Perhaps the yeast genome sequencing project underway at White Labs will answer that. There are several reasonable hypotheses for why that is the case. The reality is that over the years, strains have been selected for different properties, so many of these strains have had an artificial selection for these traits imposed upon them by brewers. Someone liked the banana aroma once several hundred years ago, so that’s the one that kept getting reused. Ultimately, it will end up being a mutation in a transcription factor or a promoter region for a gene…but I’m getting off topic. The reality of metabolism is that organisms, even microorganisms, are incredibly complex. There are dozens of simultaneous chemical reactions happening within any given cell at any time in the life-cycle of the cell, reactions that are driving carbon off to make fatty acids to repair membranes or driving nitrogen and sulfur off to make amino acids. The field of metabolomics is a relatively new discipline in molecular biology devoted to the study and understanding of “secondary metabolites” and the points at which in the web of chemical reactions that are possible in the cell, which bottlenecks exist to create an accumulation of an intermediate. Whenever there is a bottleneck, the intermediate runs the risk of being excreted by the cell…especially when there isn’t oxygen enough to metabolize everything down to carbon dioxide. 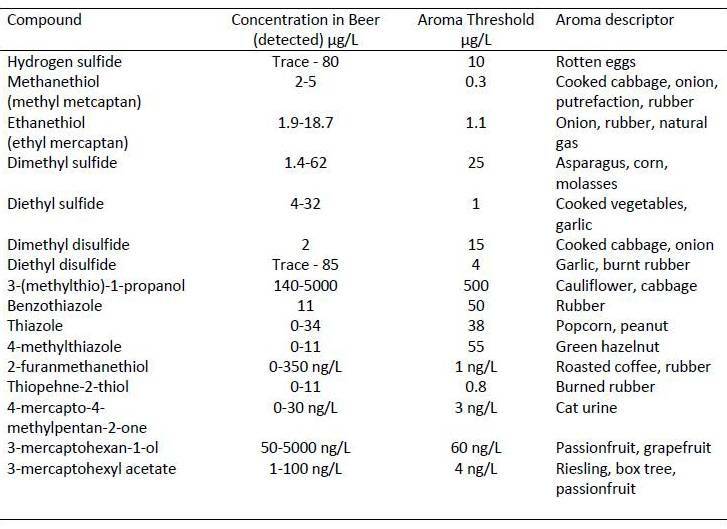 These are the conditions where secondary metabolites ends up in the finished beer. When looking globally at the metabolism of a yeast, there are three basic catabolism (breakdown) pathways one has to consider. First, how is the carbon source being metabolized? Second, how are amino acid (and proteins) being metabolized? And finally, how is the sulfur being metabolized, or what sulfur compounds are being produced? These are the three basic areas I will touch on in this post. Of course there are huge overlaps between these three areas, I just think this is a decent way to think about them. There are literally books written about this, I will limit the information here to what is relevant to beer making and possibly wine making. 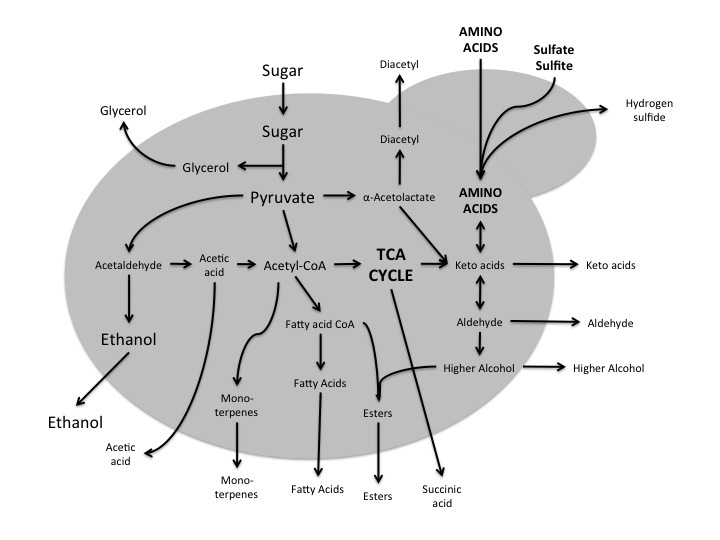 Here is a rough and simplified view of yeast metabolism starting with sugar (from the wort) and resulting in the major (ethanol and carbon dioxide) and minor products. Arrows pointing out of the cell indicate what products are being transported out of the cell and some of these products have implications for taste of the final product. The carbon source for Saccharomyces is the wort, more specifically, it is the product of the breakdown of the amylose by the amylase enzymes in the mash. A combination of α- and β-amylase in the malt breakdown the starch into glucose, maltose (two glucose molecules bonded together) and maltotriose (three glucose molecules bonded together) for the yeast to ferment. These unpolymerized sugars are what the yeast uses as the raw material to generate new biomass, generate energy and finally generate ethanol and carbon dioxide. While the majority of the carbon is used to generate energy (by products being ethanol and carbon dioxide), there are two other uses for carbon by a Saccharomyces yeast cell. First, growth. Carbon has to be used to repair and replace cellular components and the build more cells. All of that yeast at the bottom of the fermenter comes from somewhere, the carbon. I’ve heard a consequence of over-pitching yeast is that there is less cell division and therefore less “spillage” from cells as they divide, and that somehow diminishes the beer overall. It is a believable hypothesis. Carbon containing compounds that can be synthesized by Saccharomyces include diacetyl, glycerol, acetaldehyde, aceitc acid, monoterpenes, fatty acids, esters, succinic acid, higher alcohols, aldehydes, and keto-acids. While nearly all of these compounds, or classes of compounds, have a perceivable flavor, the esters are the ones that are usually detected by human tastes. Some of the more common compounds are listed in the following table (click on the table for a more readable version). Higher Alcohols – sometimes referred to as “fusel” alcohols. These are alcohols that are longer than 2 carbons (ethanol is two carbon) and can be branched chain alcohols. An example of a branched chain higher alcohol is 3-methylbutanol. These alcohols are formed by the reduction of aldehydes from amino acid degradation and TCA intermediates. 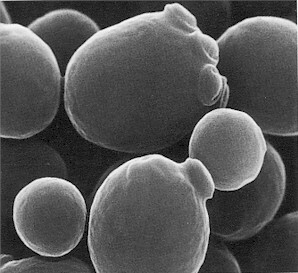 Some yeast strains produce more of these intermediates when grown at “higher” temperatures. The flavors associated with these compounds can range (at lower concentrations) from rose-like aromatic to harsh, organic, nail polish, pungent. This is honestly one of my least favorite flavors to detect in the beer. Some yeast strains make these compounds as precursors to ester production (see below). Glycerol – glycerol is a mostly tasteless compound that can be used as a carbon source by many different microorgansims. It is made by yeast in response to osmotic stress, basically being placed in a high sugar environment. Some strains (high gravity strains) make more glycerol than others and the glycerol may even be used after the sugar is depleted as a carbon source leaving very little in the final product (although it can be there). The biggest effect that the glycerol has on a finished beer is some report it is “sweet” in flavor (although I’ve tasted 100% and 50% glycerol v/v and I don’t think it has a flavor) and it increases viscosity. It definitely increases the viscosity. Diacetyl – why do we love butter but hate diacetyl in our beer? I don’t know but that is 100% the case with me. Diacetyl is the butter flavor I’m sure you are familiar with, some people say it is butterscotch flavored, which might not be as objectionable in certain styles. Diacetyl belongs to the ketone family of compounds and is derived from a compound made by cells in order to make certain amino acids, that compound is acetolactate. The oxidation of acetolactate gives rise to diacetyl, so keeping oxygen low is important to slow or eliminate the production. This compound is made to various degrees by different strain of Saccharomyces, sometimes in great excess. Typically though, it is kept a little below the flavor detection range and more importantly, Saccharomyces can metabolize diacetyl into other compounds that do not have a flavor. The compounds diacetyl are converted into are typically 2,3-butanediol and acetoin. Diacetyl is metabolized by yeast if you raise the temperature, which is why lagers have to undergo a “diacetyl rest” at a higher temperature. Secondary Acids – secondary acids are present whenever a fermentation or any metabolism is taking place. The big ones are acetic acid, succinic acid, and keto-acids. While Saccharomyces species can make acetic acid (vinegar) as a byproduct, the levels are vanishingly low and usually don’t come through as a flavor, for the record vinegar is acetic acid. Succinate or succinic acid on the other hand does. People have described succinate as being “bitter”, “salty”, and “sharp”…like an acid. I’ve had purified succinate and would add “woody”, “dark”, and “leathery” to my descriptors. It is not a very pleasant flavor in isolation but I can see at physiological concentrations adding depth of flavor, especially in combination with other acids and esters. Sort of a umami flavor…yeah that’s how I’ll put it (even though umami is usually associated with glutamate, another organic acid). Esters – let’s end this section on a high note. Esters. All yeasts produce some esters from time to time. My personal experience with different beers and yeast strain is that the German ale and Belgian ale yeasts produce the most. I’ve had beers that taste and smell like bubblegum, bananas, cloves, white wine, green apples without having those ingredients actually in the beers. These pungent aromas and flavors in beers are usually caused by esters. The proportion of esters present is heavily influenced by the fermentation temperature, typically the higher the temperature the more aggressive the esters. The most common esters produced by yeast are ethyl acetate, isoamyl acetate, isobutyl acetate, ethyl caproateand 2-phenylethyl acetate. These are at the highest concentrations at the end of fermentation. Obviously if you are adding fruit to your beers, you are dosing the fermentation with the esters that are naturally present in the fruits as well as precursors to those compounds present in the fruits, but many yeast strains make these compounds just through their internal metabolism. Esters are mostly derived from lipid metabolism and a compound called “Acetyl-CoA”…a central compound in carbon metabolism. A class of enzymes called alcohol acetyltransferases (AAT) are responsible for the formation of these compounds. AAT can combine an alcohol (such as ethanol) and acetyl-CoA to form an ester. If the alcohol used is ethanol, the product is ethyl acetate. If the starting alcohol was a fusel alcohol (from above) such as isoamyl alcohol, you get isoamyl acetate (banana flavor). The expression of the different AAT genes is what allows different yeast strains to make these compounds, the greater the number of enzymes, the more esters you will produce. So carbon is important since most compounds are made out of carbon but I decided to separate out the sulfur containing compounds because they are a class unto themselves. The levels at which we can perceive them are much much lower than most carbon / oxygen compounds. Also, the mechanism of making these compounds is a little different, as many are made by incorporating sulfate from the surroundings such as wort. Here is a summary of some of the sulfur compounds that can be produced after the uptake of environmental sulfate (SO42-). Since sulfate is a common component in brewing (many people including me add gypsum, CaSO4, to their wort), it is possible to form some of these compounds as part of a normal fermentation. Some of these compounds, dimethyl sulfide specifically, might also come from the grains or the mash procedure you use. Pilsen malt can give rise to dimethyl sulfide, DMS, flavors in the final beer if not boiled properly. Additionally, since we are talking about beer, sulfur compounds and precursors can come from hops as well. I will not discuss these in this post as that would make this even longer. I am going to focus on how some of these compounds can be made by the yeast, not the grain. Here is summary of sulfur containing compounds that can be produced by yeast and detected (tasted) by humans. Probably not a complete list. It is important to understand the different sulfur containing compounds that are found in fermented beverages, as the aroma / taste thresholds are insanely low for humans. There are some really classic and recognizable at really low concentrations. There are relatively few compounds the cell makes that contain sulfur as part of everyday metabolism but there are two amino acids commonly used in protein synthesis that contain sulfur (cysteine and methionine) so sulfur is required for growth of all organisms. Hydrogen sulfide – by far the most common sulfur containing compound made by yeast. It has a strong aroma, like rotten eggs and the threshold for detection is really low for humans. This is water but instead of the oxygen, there is a sulfur. Like water, this is produced as a reduction reaction using sulfur as the electron acceptor, this happens because organisms love to respire rather than ferment and when you take away the oxygen…yeast can use sulfur (at least a little bit) to respire. “Breathing” O2 makes H2O, “Breathing” S makes H2S. That is not 100% accurate but it is pretty close. Basically there are two large sources of H2S in the cell, the reduction of inorganic sulfate (SO4) or sulfite (SO2) or through the metabolism of cysteine or another compound called glutathione. Hydrogen sulfide is made in the early phases of fermentation typically (while the yeast are dividing usually). Fortunately, it is a gas and should off gas with the CO2 throughout the fermentation or slowly diffuse away. Addition of pantothetic acid reduces the formation of H2S by increasing the cellular pool of O-acetylhomoserine, which can be combined with H2S to form, ultimately, methionine. Thiols – Your primary aroma and flavor thiols produced by yeast are 4-mercapto-4-methylpentan-2-one (4MMP), 3-mercaptohexan-1-ol (3MH) and 3-mercaptohexyl acetate (3 MHA). 4MMP is often described as “cat urine” so that’s one to be avoided (it is believed to be a cat pheromone…not for human consumption gross), the other two have somewhat more pleasant aromas, passion fruit and berries. It is not completely clear what class of enzymes catalyze these reactions, although some believe it to be a group of carbon-sulfur lyases. Avoidance of the unfavorable thiol compounds is achieved through selection. The species Saccharomyces bayanus is known to produce considerably more 4MMP, and that is likely the reason it is not used as often as a primary fermenter in beer and wine. Interestingly, furfurylthiol is a thiol derived from a precursor in oak staves which has a burnt rubber or burnt coffee sort of flavor. This can be avoided by having more nitrogen or a higher protein content in the wort. So this is an introduction. I can’t make these articles longer than a few thousand words if I expect anyone to read them. My articles are already longer than average and I imagine that hurts my readership. Hopefully the upcoming posts on Lactobacillus or Brettanomyces will be just as interesting and perhaps a little shorter. Let me know what you think of articles like this. Was it interesting? Helpful? Boring? Leave me a comment below. I enjoyed this post and bookmarked it for me to reread. I studied chemistry and biology in college for a couple years and this aspect of beer is one I’m glad to see out there. Cheers! Thanks! I enjoyed writing it. I’ll be posting a series of these over the year. Hopefully someone will find these useful or informative. Just found your blog- As a biologist and home brewer I love it! Lovely post, looking forward to the rest of the series! Thanks for writing this. I’ve been trying to learn more about the chemistry and biology behind brewing but my background is not even remotely science based. Posts like this do make it more accessible and also give me a jumping off point to read more in depth on specific topics. Thanks for the summary, Matt. As a synthetic chemist by trade, I’m always looking for some more in-depth explanations into the biology involved in brewing. I’m looking forward to you upcoming posts. Nice summary! What is the source for the compound tables? The typical concentrations and threshold for many compounds are very different to what I’ve usually seen for. Ethyl acetate: I would say typically below 45 mg/L, but depends a lot on yeast strain and fermentation temperature. Threshold around 25-30 mg/L. Isoamyl acetate: Threshold around 1.2 mg/L. Acetaldehyde: Rarely see concentrations above 50 mg/L. Threshold around 25 mg/L. Diacetyl: I’ve never seen a (total) diacetyl concentration above 4 mg/L (and that in the wort during peak fermentation). In beer, (total) diacetyl concentrations typically below 0.2 mg/L. Threshold around 0.05 mg/L. 4-vinylguaiacol: In Hefeweizens and Belgian ales concentrations can go as high as 5 mg/L. Threshold around 0.3-0.5 mg/L. I’d love to have more references, especially for the guaiacol. I used several different papers and some had conflicting ranges for compounds so I put down the upper bound and lower bound. I’m more than willing to adjust the amounts with additional information. The diacetyl might appear to be an outlier because I found a paper describing a wine yeast strain that made TONS of it, that’s why that probably seems so high. Thanks, I’ll work my way through those in the next week and make adjustments. Just read the abstracts (I think you included one of your papers, I would have as well), looks like a lot of great material. I was using one of those papers to write this article. Maybe I should write a follow up to flesh it out a little more. Maybe I should run the Lactobacillus article by you before I post it. Nice summary, very interesting and helpful, I am glad that I read, need for these post. im digging it. Keep it up! Thanks for the very nice overview! I love this series of posts, and I hope more will come. Have you done any experiments, or ready any reports, on which secondary metabolites are consumed? You mention the “diacetyl rest” here, and that L. Plantarum can “metabolize a huge variety of compounds” (in your Lacto post), and I’ve read that Brett has a tendency to consume the metabolites of different things to create it’s own. It would be really useful to have some idea which secondary metabolites would be more likely to survive an encounter with something else. In my case, acetobacter is my initial interest, but I’m sure a lot of brewer would be interested in this info for various Brettanomyces or Lactobacillus.